Pour in the water, then, working quickly, use a wooden spoon to throughly mix and then your hands to shape into a ball. The dough should stick together. Dust surface to roll out dough. Remove the butter from plastic back and place on dough rectangle. Fold dough over each end of the butter like a burrito. Slowly press down the rolling pin such that the combined butter and down spreads and can be flattened. Brush any excess flour dust off the top of the folded dough (it would interfere with the layers sticking together). Repeat dust removal. fold Wrap dough in cling wrap and put dough in refrigerator. Let chill for 30 minutes. Dust the work surface with flour again and roll out the chilled dough in all directions until it you have a nice 3/8 inch thick circle of buttery puff pastry dough that a 9 inch pie pan will fit face down. Using a sharp knife, cut around pie pan and remove excess. Place dough on parchment paper on a rimmed cooking sheet. Cut a 1/8 inch deep cut, approximately 3/8 in from the edge of the circle. When baked this will form the rim of the tart holding fruit and juices in. Poke the dough inside the cut with a fork throughout. Do not pierce the dough outside the 3/8 in cut for the tart rim. While the dough is chilling, prepare the pralines. Mix almonds and sugar in a small sauce pan over medium heat, stir nuts and sugar until all the almonds are covered in caramel. Spoon almond caramel mister onto parchment paper to cool. 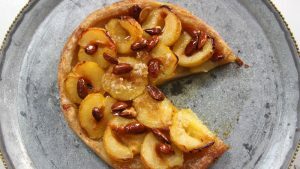 Make sure some almonds are cooing alone to be placed on the tart just before serving. Place tart in over on middle rack and bake for 45 minutes. The tips of the fruit should be a deeper color at the edges. Place all the almond pralines in a high speed food process or blender and chop into a grainy mix of chunks and power. Mix Praline powder/chunk blend with Whipped cream. Remove tart from oven and allow it to settle and cool. If any juices escaped to the pan, return to tart. Cut Tart into equal pieces and serve with praline cream on the side. * Note you may buy a good quality puff pastry (250g or 9 oz) making sure that butter is used (vs lard). You will still have to complete steps 1-10 and 1-11 to prepare your puff pastry for the tart.